Over the last week and a half, our readers have weighed in on their favorite defensive plays of the year, whittling the competition down to two finalists. Over the weekend, they selected the 2018 Block of the Year bracket champion: Olivia Arellano of Washington DC Rogue! Not just a future star in the sport but one who is already making an impact at the Youth Club Championships, Arellano flew high above the competition with this amazing layout block. For the second round in a row, Arellano managed to set a new high for largest margin of victory in this year’s competition, receiving just shy of 80% of the popular online vote in the final. Machine’s Von Alanguilan did manage to take a plurality of the votes cast via a story on our Instagram account — garnering 58% of the vote there to Arellano’s 42% — but it wasn’t enough to make up the huge deficit online. Arellano adds her name to an illustrious group of women who have won this award in years past, including Manuela Cardenas and Anna Thompson last year. Congratulations, Olivia! BE Ultimate will be reaching out shortly to hook you up with some cool gifts to recognize your victory. Thanks also to everyone who participated in this voting over the past couple weeks! More brackets coming your way soon! 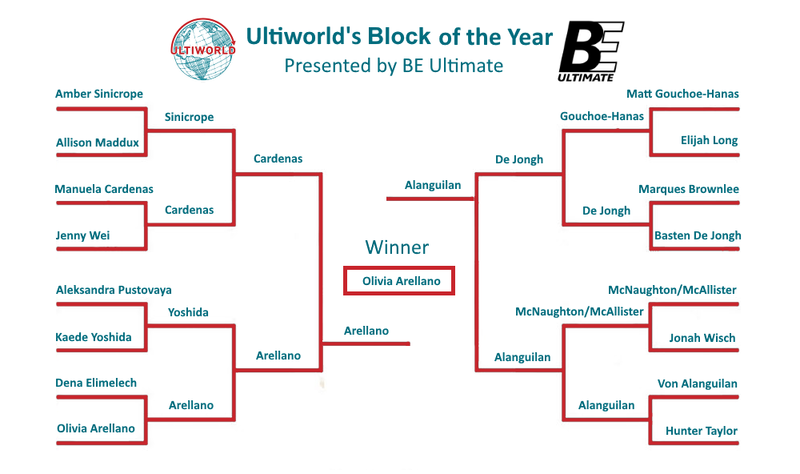 Comments on "Ultiworld’s 2018 Block Of The Year: Olivia Arellano, Presented By BE Ultimate"